Bellator will kick off their partnership with DAZN, the world’s largest dedicated live sports streaming service on Saturday, September 29 at the SAP Center in San Jose, California for Bellator 206. The event is headlined by Gegard Mousasi (44-6-2) and Rory Macdonald (20-4-0) in a battle for the Bellator Middleweight World Title. MacDonald beat Douglass Lima at the beginning of the year to secure the welterweight title. Mousasi took the middleweight title from Rafael Carvalho in May at Bellator 200. Mousasi called out MacDonald in his post-fight interview. MacDonald put up no resistance, and since then both fighters have been asking for the bout to happen. The Bellator 206 co-main event is a heavyweight match-up between Quinton “Rampage” Jackson (37-13-0) and Wanderlei Silva (35-13-0). This will be the fourth time these two have met in professional competition. Their first two bouts took place for Pride FC in 2003 and 2004. Silva won both of those bouts but lost to Jackson at UFC 92 in 2008. Ten years later Jackson, coming off two wins, looks to even the score. Silva hasn’t fought in over a year and is coming off a decision loss to Chael Sonnen. 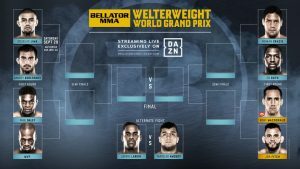 The bracket for the Bellator Welterweight World Grand Prix on DAZN has been set and will kick off with a long-awaited rubber match between Douglas “The Phenom” Lima (29-7) and Andrey “Spartan” Koreshkov (21-2). Koreshkov won the first bout via decision on Bellator 140 in 2015. The two met again late the next year on Bellator 162 where Lima secured the TKO victory. Tension is expected to be high for this one. Despite having less cage-time than the majority of fighters he’s going to face at this level, Aaron Pico (3-1-0) doesn’t seem to have any trouble facing Leandro Higo (18-4-0). All three of Pico’s wins have come in the first round, two of them via body shots. Higo is coming off a loss to bantamweight titleholder Darrion Caldwell. Keri Melendez (2-0-0) has had an impressive start to her professional career and looks to keep the climbing the ranks in the 115-pound women’s division. To do that she will have to get through Dakota Zimmerman (1-0-0) who will have some cage rust to shake off after a three-year absence. Earlier this year, Bellator and DAZN announced a multi-year landmark distribution agreement. The international streaming service will feature seven exclusive stacked fight cards per year on DAZN and another 15 that are simulcast across Paramount Network and DAZN. DAZN currently streams 15,000 live events and 100 million hours of sports content globally each year, which includes boxing and MMA. The streaming service is now available in the U.S. for $9.99 a month, just in time for Bellator 206. The first month is free for new subscribers.